Repairs to parts of the A87 in Skye will cause some evening road closures over the coming weeks. There will also be traffic disruption on the Skye Bridge, as work begins to replace drainage pipes. Overnight road closures because of work on the A87 at Ard Dorch will be in place between Monday 3rd and Friday 14th October. Ten nights (7pm to 7am) of resurfacing to improve just under a mile of road through Ard Dorch are planned. Due to the nature of the resurfacing works, an overnight road closure will be in place. Measures will be in place to allow local access and other traffic to pass through the closure approximately every hour or when it is safe to do so. The resurfacing works are planned to take place Monday nights to Saturday mornings, avoiding working on Saturday and Sunday nights. For ten nights between Monday 17th and Friday 28th October the A87 north of Kingsburgh junction near Uig will be closed for overnight work on a one-mile section of the road. Again due to nature of the resurfacing improvements, overnight road closures will be in place for safety. Local access and other traffic will be able to pass through the works by hourly amnesties. These works will also take place Monday nights to Saturday mornings, and avoid working Saturday and Sunday nights. 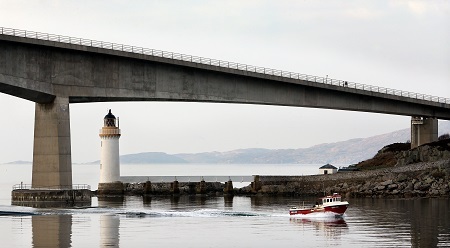 Bridge maintenance works to replace drainage pipes beneath the Skye Bridge are scheduled to start from Monday 3rd October and last for two weeks. Traffic management measures will be in place and there will be a lane closure between 7am and 6pm during weekdays with no work programmed over the weekend. The majority of the work will take place beneath the structure and will involve replacing the drainage pipes which run externally underneath the full length of the bridge. Bear Scotland say the work will improve the Skye Bridge drainage system. To allow the team’s safe access to the pipes beneath the bridge, a lorry-mounted underbridge unit will be stationed on the bridge deck. A platform will be lowered from the vehicle to allow work to be carried out underneath the deck. The work is part of an overall investment of £1.25 million across four sites throughout September and October. Eddie Ross, BEAR Scotland’s North West representative said: “We’ve taken steps to minimise disruption as much as possible during the programme of works, such as ensuring that no weekend night time working takes place at any of the sites and making sure that local access is maintained during the night time closures at Ard Dorch and north of Kingsburgh. We’ve also timed the works to take place outside of the busy tourist season to limit any impact to the local economy. “Consultation for the schemes at Ard Dorch and north of Kingsburgh is ongoing and we’ll update stakeholders once final dates and times are confirmed. Work on a three quarter of a mile stretch of the A87 north of Broadford Cemetery, which began on Wednesday 21st September, is scheduled for completion by the end of this week.